Wedding season is fast approaching and for many brides-to-be thoughts may be turning to preparing their bodies for the big day. Here are some tips on how to look and feel amazing in the dress of your dreams in a healthy and balanced way. A quote that I heard recently springs to mind when I think of the picture perfect images that brides-to-be are looking at constantly – “even the girl in the magazine doesn’t look like the girl in the magazine”. That nip and tuck look that you see on the models in bridal magazines is very often the work of some serious digital alteration (shock horror, you mean her waist isn’t really that small?). It’s fine to want to work on certain areas of your body for your wedding but be realistic about your natural body shape and don’t waste your time trying to be something that you’re not and stressing yourself out in the process. The best way to get results from exercise is to do something that you enjoy and that you’ll want to continue to do. If you’re quite easily motivated you might find it easy to exercise alone but if you need a little push then consider joining a class, hiring a personal trainer or signing up to an online plan that has some form of accountability. It’s highly likely that you’ll be too busy to put a proper structure on your meals and exercise while your preparing for your wedding so it can be a good idea to save yourself some time and energy by paying somebody else to help you. It is completely possible to lose body fat and inches by following a healthy, balanced diet. You don’t have to feel deprived and make life miserable for yourself (and those around you) in the run up to your wedding. Follow a sensible meal plan that includes lots of fresh food but leaves plenty of room for real life. Start getting prepared each weekend for the week ahead to save yourself time and stress and to give you a better chance of sticking to it. While preparing for your wedding should undoubtedly be one of the most exciting things you ever do, it’s certainly not without its challenges particularly in the last few of weeks when a lot of the small jobs need to be done. 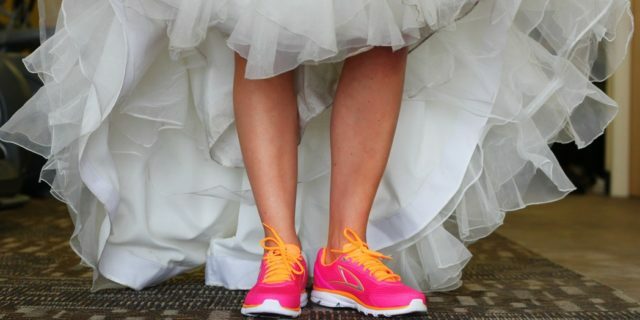 It’s at this time that many brides-to-be ditch the exercise and healthy eating because they feel like they’re too busy. However, it is in fact the time when they most need it. Setting aside specific time that’s just for you and your headspace can be the difference between enjoying something that you’ve most likely spent a small fortune on or becoming the dreaded Bridezilla.